This week's Long Range Forecast sees the addition of one of the most widely anticipated films in recent years: The Hobbit: An Unexpected Journey. Following a number of production delays over the past decade, director Peter Jackson returns to Middle-earth nine years after The Lord of the Rings: The Return of the King broke box office records around the world and swept up eleven Academy Awards. Jackson recently made the announcement thatThe Hobbit will be divided into three films with the second film dropping in December 2013 and the final installment in July 2014. - Fan and mainstream audience anticipation has been noticeably high over the past decade as demand for a Hobbit film kicked in immediately following the massive commercial and critical success of the beloved Rings trilogy. While perhaps not a strict apples-to-apples comparison, the closest historical reference may be Star Wars and the pent-up demand for the prequels entering 1999. - When it comes to widely popular franchises, time gaps between new installments are generally a big advantage (see Star Wars and Indiana Jones). - With each film in the previous trilogy increasing in both opening and total grosses, Rings was one of the first (and still few) series to maintain and/or build upon its audience with every installment. That kind of popularity will translate to huge interest in this film. - Opening on a Friday will be a big three-day opening weekend advantage in comparison to the films of the original trilogy (which all opened on Wednesdays). Given the greater distance from Christmas Day this time around, this may indicate the studio's confidence in being able to attain a big opening. The current December opening weekend record belongs to I Am Legend ($77.2 million). The Hobbit should have no trouble re-claiming that record (once set by all three Rings movies during their time). - Though being close to Christmas can potentially reduce the potential of a massive opening, The Return of the King posted the 7th best opening weekend in history during 2003 despite burning off demand with its Wednesday release. The current 7th best all-time opening is New Moon's $142.8 million. - 3D and IMAX should prove to be strong draws for this kind of film. 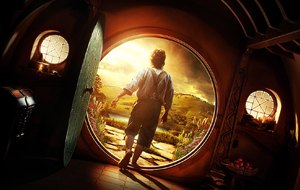 - The lack of directly competing family films in the market gives The Hobbit a clear path toward box office success as other studios have generally steered clear of the film with their post-Thanksgiving release slates. - Holiday releases, including blockbusters, typically enjoy strong legs with or without big opening weekends during the holiday season. - Warner Bros.' decision to only release the high-frame rate 3D prints in select markets should allow it to find enough of a test bed audience without having much effect on the overall gross in case audiences don't go for it. - Having a "lighter" tone than the Rings series may help to increase its already strong appeal with families, particularly parents and younger children. - Adjusted for inflation, The Fellowship of the Ring's original $313.4 million domestic run would equal $437 million today. Adding in 3D and IMAX price premiums, that would be roughly equal to over $490 million. - Other ticket sales comparisons adjusted for inflation and 3D (where applicable): Indiana Jones and the Kingdom of the Crystal Skull ($400 million), The Chronicles of Narnia: The Lion, the Witch, & the Wardrobe ($409 million), Toy Story 3 ($418 million) and Harry Potter and the Sorcerer's Stone ($505 million). The Return of the King's $377 million gross in 2003 would adjust to roughly $550 million (including 3D) today. - Like The Lord of the Rings, the original Hobbit novel is one of the best selling fictional books of the 20th century and is regarded highly among children's classics. In fact, the "prequel" term for the latter is a misnomer when considering The Hobbit was published 17 years before Rings. - A gap of nine years between it and The Return of the King is considered as much of a disadvantage as an advantage by some, potentially having waited to long to capture the momentum from the first trilogy. - Massive book sales aside, The Hobbit not having the same universal pedigree as The Lord of the Rings could equal a decrease in admissions. Could any added family appeal offset that? - Jackson's decision to turn two films into three during the eleventh hour of production has caused an uproar in some online circles. Will that translate to forced story lines, or only serve to keep expectations very modest? In either case, it likely won't affect the upfront interest in the film but more so the legs and results of the second and third films in 2013/2014. - The high-frame rate 3D was met with generally negative-to-mixed reactions at CinemaCon earlier this year. That said, the footage was incomplete and recent claims suggest the format may play better with extended scenes that have gone through post-production instead of fast-cut footage. In either case, the majority of audiences will only have access to standard 3D with this film anyway. - Capturing lightning in a bottle with die-hard/online fans more than once can be tricky. Again, see the Star Wars prequels and the fourth Indiana Jones for evidence. Those, however, were still huge box office hits. - Will it be able to bring in the same level of repeat admissions that The Lord of the Rings films (which enjoyed Oscar season bumps) did? Notable changes on our forecast this week include Cloud Atlas, Silent Hill and Fun Size. Check out our predictions for The Hobbit: An Unexpected Journey and other upcoming films in the table below. Cloud Atlas Oct 26, 2012 Warner Bros.
Shawn Robbins, Phil Contrino, Daniel Garris and Alex Edghill contributed to this article.